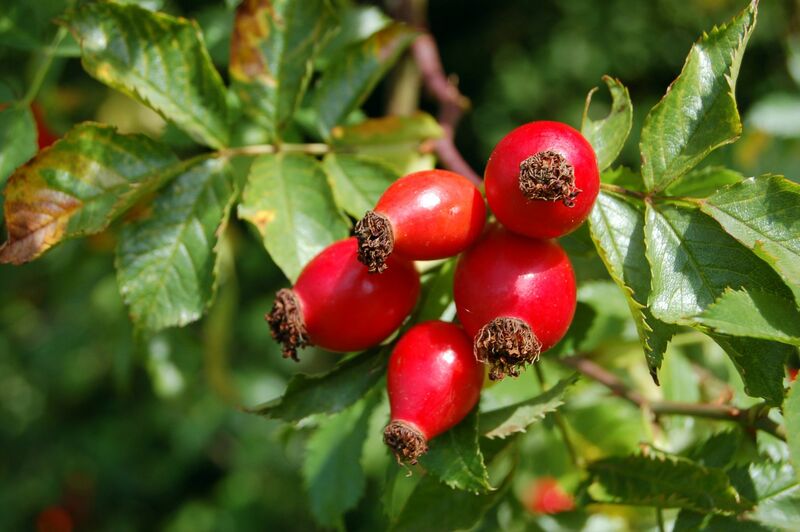 The Rosa Mosqueta (Rosehip) is a shrub belonging to the Rosaceae family, Rosidea subfamily and genus Rosa. The scientific name is Rosa Rubiginosa or Eglanteria. It grows wild in the poor soils of the plains and mountains of low elevation in the foothills of the southern region of the Andes range, in Chile and Argentina. It can grow over 2 m. high, the stems are thin, flexible and curved and bear hooked purplish prickles. The plant has oval-shaped fleshy red hips (fruits), up to 2 cm. across, full of seeds, called achenes. The achenes are very rich in ascorbic acid, vitamin A, riboflavin, niacin, malic and citric acids, sugars, and others. These fruits contain many seeds (15-20) from which is extracted a yellow oil with reddish tones. It is one of the products that have aroused more interest in the areas of cosmetics and dermatology. 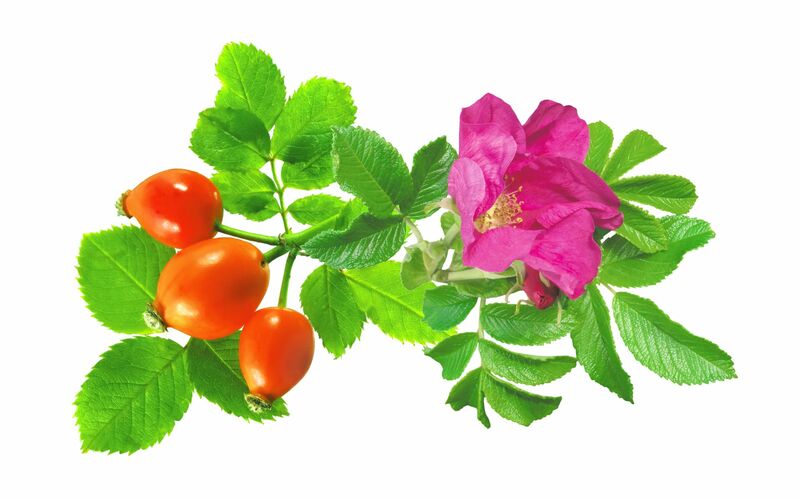 After observing the composition of the Mosqueta Rosehip Oil, it is hardly surprising to discover why it is one of the most powerful skin regenerators, as virtually between 70 and 80% of its constituents are polyunsaturated fatty acids, particularly suitable for regenerating damaged tissue, delaying the onset of premature aging lines, preventing the formation of wrinkles and treating the skin affected by burns or exposure to radiation among others. The Mosqueta Rosehip Oil is able to penetrate to the deepest layers of the skin and cause the activation of the cells to stimulate the production of collagen and elastin, which are responsible for the firmness and elasticity of the dermis. While repairing and restoring the vitality of the skin, this oil is capable of attenuating skin marks such as scars or stretch marks and making the skin regain its normal balance after an aggression. Patagonian Indians used the Mosqueta Rosehip Oil to maintain the freshness of the skin, heal wounds and treat various diseases. Oleic acid (10-20% - polyunsaturated fatty acid). Cis-linoleic (41-50% - polyunsaturated fatty acid). Alpha-linolenic acid (26-37% - polyunsaturated fatty acid). Palmitic acid (3-5% - saturated fatty acid). Stearic acid (1-3% - saturated fatty acid). The high content of Omega-6 fatty acids, essential to the human body, gives the Mosqueta Rosehip Oil exceptional properties. In its composition stand out the linoleic acid (41%-50%) and the linolenic acid (26%-37%). These acids are closely related to the synthesis of collagen and are very important to the chemical processes involved in tissue regeneration and cell growth, besides being essential in areas where there is a high rate of proliferation of new cells, as in the face. On the other hand, the trans-retinoic acid or tretinoin (0.01%-0.10%), capable of reducing the tumourigenicity of cells, has a beneficial effect on photo-aging, wrinkles treatment, diminishing and improving of scars, reduction of stretch marks and so on. Its use is supported by the scientific community for physiobiological and cosmetic treatments and for preventive or corrective action in the skin. It is worth noting that there is no known toxicity or side effects associated to its use. It is one of the few natural remedies prescribed by prestigious doctors in the field of cosmetics, what justifies its importance.